Swami Thyagarajar Temple is located in Thiruvarur,Tamil Nadu. This Thiyagaraja temple is one of the most ancient heritage sites in India. 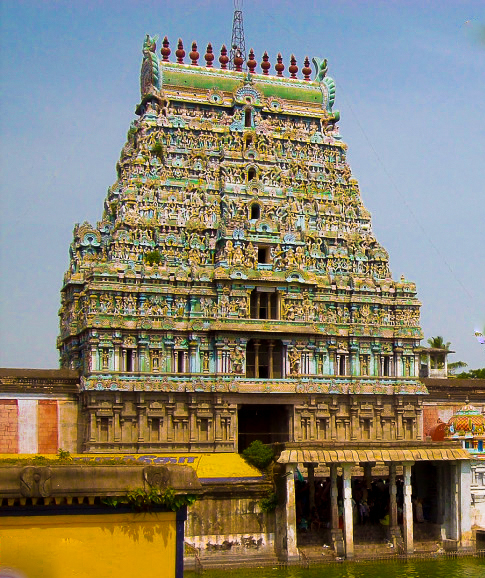 The current structure of the temple reflects the cultural history of the Tamil region for a period spanning over several thousands of years in recent past.History has it that the Thiyagaraja (Somaskanda) image at Thiruvarur was created and worshipped by Lord Maha Vishnu Himself.This is one of the Padal Petra Sthalams.The presiding deity is revered in the 7th century Tamil Saiva literary work Thevaram. The Temple: The temple complex covers 30 acres, and is one of the largest in India. The temple has four large gopurams ( gateway towers). The tallest is the eastern tower, with four stories and a height of almost 100 feet (30 metres).As per records it is seen that the present structure was built during the Chola dynasty in the 9th century, while later expansions were made by Vijayanagar rulers of the Sangama Dynasty (1336–1485 CE), the Saluva Dynasty and the Tuluva Dynasty (1491–1570 CE). The temple has 100 plus sannidhis (shrines), a record for having maximum number of sannidhis for a temple in India. There are 365 Shiva Lingas representing the days of the year. 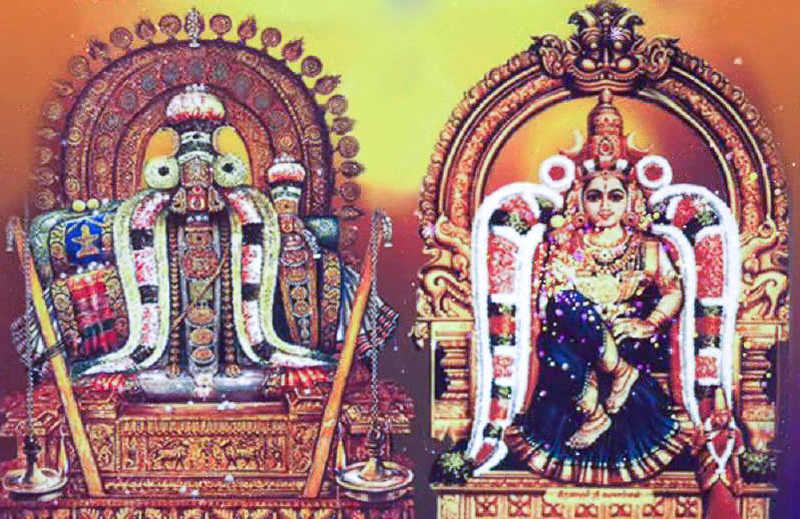 The two main sannidhis of the temple are for the moolavar (main deity) Sri Vanmikinathar (Lord Siva) and Thyagarajar.Sri Vanmikinathar in the form linga is the most ancient, and derives its name from tha anthill(putru). Poet saint Appar, refers Sri Vanmikinathar in his hymn as 'putru irukondan'(one who resides in the ant hill). The Sthala vriksham(temple tree) is paatiri( fragrant trumpet flower tree - Sterospermum chelonoides). Here the Navagrahams are located towards south in a straight line also located in northwest corner of first prakaram. Abishekam is performed only to the Maragatha Linga ( emerald Lingam) known as Veedhi Vidanga Linga, believed to have been worshipped by Indira .Three abhishekams are performed every day. After the abishekams, the Maragatha Lingam is placed in a silver box and then locked in the presence of officials and placed on the right side of Lord Thiagaraja. In this temple, there are two Chandikesvarars, one known as Chandikesvarar and the other called as Yama Chandikesvarar,The temple has many large mandapams (halls) Rajendra Chola hall, also called as Sababathi hall has a museum of the temple. Some of the major sannidhis in the temple are of Aananthiswarar, Neelothmbal, Asaleswarar, Adageswarar, Varuneswarar, Annamalieswarar and Kamalambal. Faiths & Beleifs: There is a nandhi (bull) here called Brahmma Nandhi, behind Lord Veedi Vidanga Vinayaka sanctum. Devotees pray to the nandhi and fill the tub near it with water seeking rain. People offer 'paal saadham' (milk rice) to Mother Kamalambal on Navami day in Purattasi (September-October) for good health. Those suffering from fever and seeking longevity offer Pepper Rasam to Lord Juradeva. For uplift in life, devotees perform Mukundarchana to Lord Thiagarajar which was said to have been performed by Lord Vishnu Himself. Festivals Margazhi Tiruvadhirai in December-January, Lord Thyagesar's Pada Darshanam (darshan of foot),10 days Panguni Uthiraim in March-April,10 days Aadi Pooram in July-August,Chithirai festival during April-May, are some of the important festivals of the temple. Regular Pradoshams poojas draw huge number of devotees. Thiruvarur Thaer (Chariot Festival) The annual chariot festival of the Thygarajaswamy temple is celebrated during the Tamil month of Chitrai (April – May). The chariot is the largest of its kind in Asia with a height of 90 feet and weighing 300 tonnes. The chariot comes around the four main streets surrounding the temple during the festival. The event is attended by lakhs of people from all over Tamil Nadu. 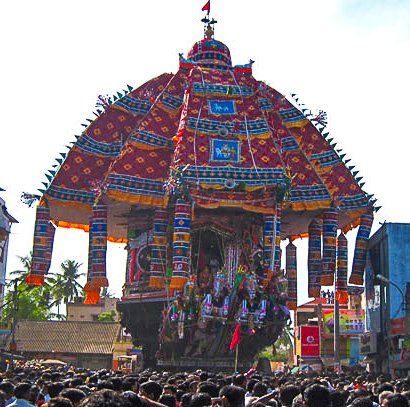 The chariot festival is followed by the "Theppam", (float festival). Temple location The temple is in the heart of Tiruvarur town and is easily reachable. Temple Timings The temple is open from 5.00 a.m. to 12.00 a.m. and from 4.00 p.m. to 9.00 p.m. There are buses from Mayavaram (Myladuthurai) town to this place and also, autos,cabs available at a nominal rates. If you drive by your car, you can reach there from Mayavaram in about 1 hour and 30 minutes. Where to Stay? There are a few budget hotels here, and there are better hotels at Mayavaram. Other interesting places around Thiruvarur Thirukollikadu Pongu Sani temple, Mannargudi Rajagopala Swamy temple are places worth visiting.